STRICTLY THE HOTTEST TICKET ….. Among the Strictly touring live shows, it is almost a tradition that Brendan Cole performances sell tickets by the bucket load! 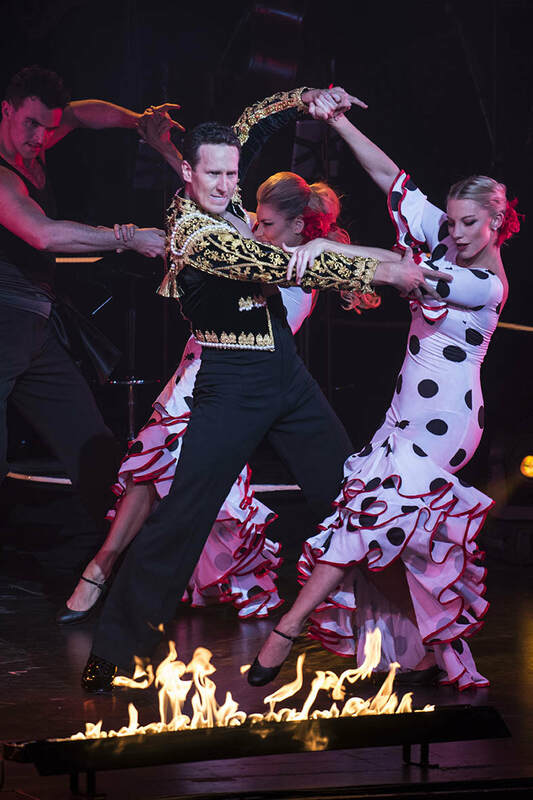 PMB Presentations, the presenters of this ninth Brendan Cole Tour, marvel at the fanatical audience support and the feedback from theatres and halls who say that a Brendan Cole Show is the yardstick by which other Strictly associated shows are measured. These are no ‘sit back and watch’ productions … each show is full on high energy dance dynamite, up close and personal, with scintillating guest dancers, and a scorching 14 piece band and singers; superb choreography, stunning lighting, amazing special effects. The audience get to see every style of ballroom and Latin dance from Brendan and his hand-picked champion-ship dancers (each new production features a different cast) performed to the music and songs of some of the greatest legends and contemporary artistes. Every new production features at least EIGHT dancers, FOURTEEN musicians and singers, TWENTY - THIRTY musical numbers, DOZENS of dance shoes, HUNDREDS of costumes. He is ONE of only two professionals to have competed in the entire Strictly Come Dancing TV series. He danced the FIRST dance on the FIRST show and won FIRST prize He has just embarked on the FOURTEENTH year of the show. His partners have included Natasha Kaplinsky; Kelly Brook; Lisa Snowdon; Jo Wood; Victoria Pendleton, Sunetra Sarker; Kirsty Gallacher; Sophie Ellis-Bextor; and pop star Anastacia.